Two things constitute any distinction. First, there needs to be something to distinguish, some differentiation the observer can make. And secondly a motive by the observer to differentiate in that specific way. For Niklas Luhmann, our environment holds an infinite number of possible differentiation. The number of connectable elements is so vast and allows for so many variations that it is a question of motive how one distinguishes. Any observer continually reduces the complexity of the system by drawing distinctions. For example the word and the object ‘chair’. We reduce each observable object with a seat, back and most probably four legs into the meta-concept of ‘chair’ but in the world, there are only the individual items. We are drawing this distinction around a certain group of common objects. If we include objects without a back or an object with three legs is up to us. Rather than naming each item we draw distinctions by grouping and through this reducing complexity. Each chair itself is also a reduction of complexity as it might consist of wood, metal, screws, textiles, plastic and much more. Each of the named parts of a chair again is a reduction of complexity. This reduction of complexity is the drawing of distinctions, the creation of form. It is an act by an observer, driven by a motive. Any map reduces the complexity of the actual system it represents. But while Korzybski is pledging for usefulness, Spencer Brown is asking for a motive. An image of a pipe is not a pipe. Within the map/territory logic, we could say the image of the pipe is a map. The text below the picture is a map too. The territory is the real pipe, the stuffable, smokable pipe. The calculus of distinctions would argue all of these are distinctions. ‘Pipes’ are just one categorization one drawn distinction we make. The pipe can refer to briar, calabash, corncob, chibouk, chillum, hookah, kiseru, midwakh or sebsi. Each of these again refers to regional, or specific usages. Pipes are just what we distinguish as a pipe. Is a hookah the territory of Magritte’s pipe? Or are these two distinctions we draw? There is no direct territory to the image of the pipe Magritte drew. It is us differentiating what is included by the word ‘pipe’ and by the image Magritte drew. Carroll’s poem is a parody of the reduction of complexity. Reducing the environment until there are no distinctions left. His maps end where the distinction of the form begins (This is not entirely correct as the map already marks directions and a scale outside the map.). The empty space is where the instruction to draw a distinction starts. What is drawn into the map depends on the motive of the observer. Without drawing a distinction there is no form, without form there is no asymmetry within the space without asymmetry there is no knowledge (Brown, 1969, Lau, 2015). Carroll’s blank map might be a map all can understand as there is nothing to understand. Understanding only arises out of the act of drawing distinctions. In Borges story, we can see the difference between the map/territory distinction and the notion of the form. The map is seen as an abstraction of the territory, something that is either very close or very reduced and abstracted from it. But there is a territory that the map is imitating abstractly to be useful for the observer. In Brown’s form, the map cannot become like the territory as there always needs to be an observer who draws the distinction which is then drawn on the map. There is no territory without an observer, without someone or something that draws a distinction. There are even cases in which the territory imitates the map. Mapmakers sometimes add fictional places to their maps as copyright traps for their competition. In the 1930s mapmakers, Otto G. Lindberg and Ernest Alpers combined their initials and added the fictional village named ‘Agloe’ to one of their maps in the in Delaware Country. A few years later one main competitor published a map with an indication for the town Algoe. The mapmakers threatened to sue the competition, but they protested and argued that Agloe exists. The Agloe General Store opened after the intersection became frequently visited because of the map (Jacobs, F., 2014). The map created the territory. While this example is somewhat an extreme example of the map/territory relation, it questions to what extent our own making influences what we observe (‘observer effect’). Something simple as measuring the length of a coastline shows how observation influences what is meant to be the territory. In the 1960s scientist, Lewis Fry Richardson set out to research the relationship between the length of a common border two countries have and the probability that these two nations go to war. In this process, he found substantial inconsistencies between various sources of international borders. These discrepancies arise out of the way of measurement. The shorter the ruler one uses to measure the longer the resulting coastline. This first feels counterintuitive but the shorter each measuring unit is, the observer can acknowledge more features within the landscape. As a coastline has features on every scale, the more fine-grained our measures become, the longer the shoreline becomes. The method of observation defines the length of measurement. The fractal structure of something as a coastline means that the analysis determines the extent of it. Our distinctions assess our observations. Our retina, measuring sticks, sheets of paper are all medium/form relationships that draw distinctions. The map-territory relationship suggests an end, some ground truth at some level.The notion of the form always questions the observation and asks for the two assumptions: Which distinction has been drawn for this specific form and in what medium did this happen? The map is not the territory. There is no territory. There are only maps of maps of maps. Knowledge, with its roots in ‘acknowledge’ or ‘recognize’ (German: Erkenntniss -> Erkennen) accounts for this. Knowledge always needs someone to recognize. It is an active act, not something given by the world some territory that holds the ground truth. That said Niklas Luhmann makes an important point in his writing ‘Erkenntnis als Konstruktion.’ The operation of the form does not imply that there is no environment (‘Umwelt’), it is just not reachable as there is always a construction of form necessary to create knowledge. The environment does not know any distinctions; it is just what it is. But for us to recognize the environment we need forms to do so. Every observation needs to be done by someone. Without the observer’s distinction, there is no recognition and no knowledge. This means that there is no knowledge in the environment itself. Knowledge is a product of distinction. But at the same time once we draw distinctions there is feedback from the environment. The environment is not arbitrary otherwise we could draw any distinctions within any medium. Without form, there is no knowledge. Without the environment, everything would be possible. Bateson, G., 1972. Steps to an Ecology of Mind, University of Chicago Press. Jacobs, F., 2014. Agloe: How a Completely Made Up New York Town Became Real. bigthink.com. Available at: http://bigthink.com/strange-maps/643-agloe-the-paper-town-stronger-than-fiction [Accessed December 16, 2017]. Korzybski, A., 1958. Science and Sanity, Institute of GS. Krämer, S., 1998. Form als Vollzug oder: Was gewinnen wir mit Niklas Luhmanns Unterscheidung von Medium und Form? userpage.fu-berlin.de. Available at: http://userpage.fu-berlin.de/~sybkram/media/downloads/Aufsaetze/Form%20als%20Vollzug%201998%20(51).pdf [Accessed October 31, 2017]. Luhmann, N., 1970. Soziologische Aufklärung. In Soziologische Aufklärung 1. Wiesbaden: VS Verlag für Sozialwissenschaften, Wiesbaden, pp. 66–91. Richardson, L.F., Statistics of Deadly Quarrels, 1809-1949. ICPSR Data Holdings. Spencer Brown, G., Laws of Form. manuelugarte.org. Available at: http://www.manuelugarte.org/modulos/biblioteca/b/G-Spencer-Brown-Laws-of-Form.pdf [Accessed November 15, 2017]. Next Mitra Azar – The Algorithmic Facial Image (AFI) and the relation between truth value and money value. Interesting article, I thought bringing together different examples of ‘mapping’ reality was really productive, from Magritte’s pipe to Borges classic map that covers the territory. Loved the story about Algoe as a way to show the communication between the map and the territory, rather than seeing it as a one-way abstraction. Of course one of the ways that the map is altered through contemporary computational cultures is via filtering – my map is not your map. Or in other words, the ‘map’ – as a single, stable object that we can point to as a way to gain consensus or prove points, begins to breaks down. This happens quite literally, for example with Google’s controversial differing views that it provides of the Tibetan border to those inside and outside of China. But the ‘filter bubble’ (Pariser) also provides a highly customized ‘mapping’ of political reality based on your preferences, social network, etc. In this sense the world according to one Facebook Feed is demarcated in an entirely different way than another Feed. I guess my challenge would be the same as Luhmann’s: “Das ist naiv, so wird oft eingewandt. Aber wie anders als naiv soll man anfangen?” To be sure, maps are abstractions that ignore important facets of reality, and of course its worth paying attention to what we give up when we acknowledge something as knowledge. But Luhmann’s point is that we need these simplifications to make sense of the world – they’re wrong but they’re also highly productive. 😉 What seems critical to question then, is not the veracity of mapping as a mode of technicity – of course they’re all ‘false’ to a greater or lesser degree. But rather, going back to your first paragraph that I found really great – where is the boundary and who sets it? What parameters specify the internalized and accepted from the externalized and unmarked? And what implications are there for accepting one (inevitably false) boundary instead of another one which is false in a different way? This creates a structured form of critique which allows us to question the standpoint of the forms we create. I absolutely loved reading this paper – it’s beautifully written and so rich in content. Like Luke, I can’t help wondering where you could take this in terms of digital mapping such as Google (but I almost think it might spoil it! )… but also I was thinking especially about 3D mapping and modelling – I’m really interested to find out where you plan to take this. A friend is currently working on the politics of creation in terms of 3D digital modelling – it’s fascinating stuff. There are quite a few cultural geography texts that might be useful to you (if you haven’t explored already) – I can pull a few together if you are interested? (I’m half in a Geography dept, but not actually a Geographer). on my injured map, new borders of Sellotape. How can I trust the ghostly blue-veined hand? apex and stem on Standard European Paper? You are not the stuff of our legends. of fractured hearts? Sickness in the family. you cannot believe you have come to this. seaman but wanderer, in this Age of Darkness. Thank you Pip for you comment. I’m an data visualization researcher and use G.S.Browns Laws of Form as a theoretical foundation to my practice. The above text is an extract of my PhD research in this area. I’m applying this to my practical work also to one or two 3D models I made (like this one: http://cosmicweb.kimalbrecht.com/). I would really appreciate hints towards cultural geography writings as this is nothing I’m strongly familiar with. Dear Kim, thx for sharing! I’m myself interested in the relationship between map and territory – and especially in the fact that the distance between the two is today shrinking in parallel with the shrinking of the distance between body and interface, embodied and (dis)embodied image, fiction and reality – with interesting political consequences. I’m trying to think about the figure of the observer in relation to what you wrote. I like the idea of an observer as condition of existence of a territory, at the same time I think this observer should be defined more precisely. The thing gets a little confusing for me when you refer to the figure of the environment, which I’m having an hard time to understand in relation to territory and map. You refer to environment in terms of Umwelt, in relation to Luhmann’s position. I’m indeed debating between understanding environment as a blank unreachable surface the way Luhmann is proposing while having an hard time with the german original reference of the word environment (Umwelt) you add in your comment to Luhmann’s quotation. This is because I’ve been used to think about Umwelt as a very specific type of environment, already related to an observer – Umwelt referring to the unique interactions (or intra-actions with Barad) between a given space and different organisms within different phyla, including the reserve of affordances inherently inscribed into the space for this or that organism or phyla. Phyla which indeed act as an observer, drawing distinction on a bio-semiological level. In this sense, environment (Umwelt) is already territory. At the same time, we might need to think about what kind of observer we’re referring to, and how this observer might change by passing from a territory to its map – along with the different types of distinctions the observer might be able to draw over a given territory, or its map. 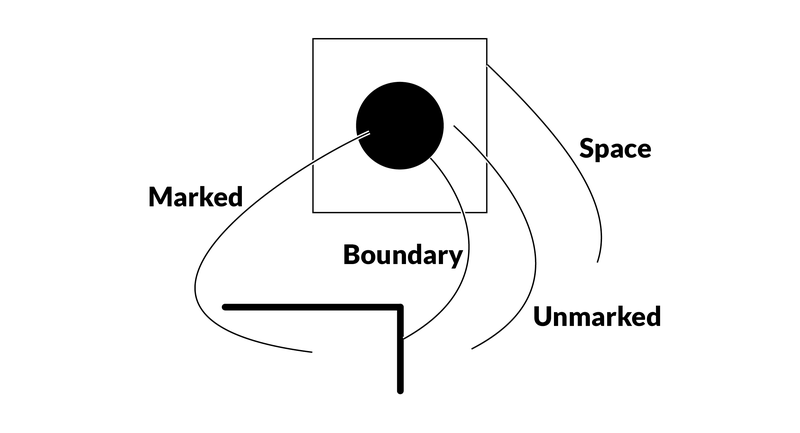 The different nature of the observer between territory and map (and not the fact that both territory and maps are related to an observer) and the different type of distinctions this observer is enabled to draw, is the reason that allows Merleau-Ponty (1945) to provide a romantic understanding of the territory as “a world prior to knowledge, this world of which knowledge always speaks, and this world with regard to which every scientific determination is abstract, signitive, and dependent, just like geography [maps] with regard to the landscape [territory] in which we first learned what a forest, a meadow, or a river is”. An observer draws a very qualitative different type of observations over a territory and over its map. I tend to think of distinctions drawn over a territory as analog, continuous distinctions which are not strictu-sensu replicable (the movements of an animal within a territory is always different despite patterns and similarities), while distinctions over a map as digital, and indeed replicable. In this sense i think it is only possible to think about Magritte painting as a metaphoric type of map, because a painting cannot be a map because a painting is not based on a sufficiently dense and discrete reproducible notational system, which is what constitutes the maps – Goodman wrote extensively about that in his Languages of Art. I have the impression you’ve been tempted to assimilate the observer to a human subject – and by doing that it seems to me that you reach the conclusion that “environment does not know any distinction”. If we follow the idea of environment as Umwelt, though, environment is already distinctive, and the idea of environment as a blank state becomes an onto-epistemological regulatory concept, not a graspable entity – in line with your overall Batesonian position on the infinite representational recess of the map into itself. The references to Carrol and Borges are great because they open the space for the reversibility of the map into the territory and vice-versa – to the point that we might revise Bateson saying not only that a map is a map of a map, but also that a territory is a territory of a territory. Instead of saying that an environment does not know any distinction I would maybe say that the environment is the coexistence of all the possible distinctions for all the points of the space at the same time and for all possible observers – thus moving towards a Bergsonian understanding of matter as individuating being which would connect your concept of observation to individuation, and would possibly allow to moving away from an anthropocentric understanding of the observer). I’m personally very interested in seeing if it is possible to think about the relation between territory and map in parallel to the the degree and type of embodiment an observer manifest while operating on them – and i think this might be the way to talk about territory and map in relation to non human agents. I think Luke and Pip seems already to wonder about what happens in relation to 3D mapping and observers becoming filter bubbles, bots, neural networks, algorithms for machine vision and so on. Looking forward to talk more! Thank you mitrazar for this very thoughtful comment. your references are great. I’m unfamiliar with some of the and have to look them up. All the ones I know are spot on. I fully agree with most of your points. Something I didn’t wanted and should reword this, an observer doesn’t need to be human at all. A seed which draws a distinction in which direction to grow based on the light of the sun draws a distinction. Same can be said about bots, neural networks (these are especially interesting as in unsupervised learning the algorithms draw their own distinctions within the given space) or our smartphones and their sensors which draw distinctions within the space (I made a project about this recently: https://kimalbrecht.github.io/ai-senses/). The Umwelt, Territory, Maps differentiation is something I would very much like to discuss in more detail. From my current perspective map and territory just depend on the viewpoint of the observer. The Umwelt, after Luhmann is a much more complicated term. First the term, as you also acknowledge is a difficult one because there are so many definitions and usages of the term. Luhmanns Umwelt is a very specific one, one in which no observer has drawn a distinction. It might be good to think of a different term. I’m also unsure if Umwelt is the right way to think about this and would very much like a fruitful discussion around this. First of all, interesting article! – basically, as I understand it, on the fundamental conditions for knowledge production? What does an observer / researcher focus on, what does she include and exclude, what methods and what instruments does she use, and what politics lie behind all these choices? This seems to be a highly relevant discussion – in a digital context as well. And to touch on some of the previous comments on the relation of your text to our contemporary computational culture, I thought I might add that I find it difficult distinguishing between the anthropocentric and non-anthropocentric today – is there any machine free of internal human observers? To me it seems that machines are much more influenced by human beings than what is being acknowledged. In the end a representation of a coastline made by Google is also deeply inscribed, encoded with human distinctions, politics, values etc.? This might be more of a comment on some of the comments in here than a question directed at you. Also, out of curiosity, I would be interested in hearing more about how these sorts of philosophical investigations and more general reflections on knowledge production that you do relate to your work as an information designer. I’ll try to formulate this as an actual (and, I hope, more concrete) question: could you elaborate on the politics of knowledge production and representation and why this might be relevant to your specific position as a visual researcher? yes you very much summed up my basic motivations for this research within your first paragraph. My interest in the connections between the Laws of Form and my work as an information designer started while working in a physics lab researching large networks mainly form online generated databases. Within the lab these databases where often seen as the given, the ground material that often needed cleaning but where not much questioned regarding how they are build and in what way that influences the knowledge developed throughout the research. This lead me to epistemology, Spencer Brown and the politics of my own work as well as the politics of the interface and more generally digital culture. I can only fully agree to your second paragraph. Everything digital is made by humans. So the closer you look at digital artefacts the more their humanness becomes visible. This is very fascinating as all of this is humanly made in many ways these things operate in ways that are very different to our usual surroundings. Your question is great. The theoretical work is very much changing some of my practice. Projects in which I’m free in what I’m doing have more reflection, I’m currently interested in not only visualizing but also designing the data and doing the collection process by myself. When it comes to collaborative works with other researches this is not always possible as they have their own research questions which are often far away from these philosophical questions. Interesting writing style and as Luke noted, the Algoe story really gets the message across. Your article also brings to mind distances. Even distances entail the political and they are equally fluid and dependent on the observer, although practically fixed. For instance, although to south Europe, Egypt is a neighbouring territory, however, a bomb attack in Egypt is perceived as an event happening in a territory further than a bomb attack in the United Kingdom. So, we are observing an event from a ”safe distance” which is too long for the event to be perceived neither as dangerous, nor emotionally overwhelming. But this distance is as fluid as diplomacy. You have definitely researched the topic more thoroughly than we could ever have. The only other point that we can offer which might be helpful is Lacan’s views on the symbolic value of relations (relevant to the politics of territories) and the role of the third person (e.g. the observer) in actualising this symbolic value. Hello you two, yes Lacan is great. I read a bit about his view on organisms and subjects. Highly relevant. Distances, space theories and geopolitics is something I still have to look into in more depth, especially because Browns distinctions are drawn within a space. But your example very much shows how distance is something created. Also thinking about this regarding the digital space might be very interesting as space and distance both exist but in very different settings.